Despite being located just a couple of kilometres from the bustling Indiranagar, the New Thippasandra neighbourhood seems like a completely different locality. No lanes lined by high-end brands, restaurants and breweries here. What you do have, instead, is an entire market road with shops selling everything you could possibly want to set up home. Plus, restaurants and roadside stalls to fuel up at. Go ahead and explore the hood, with our guide to the shopping and food scene in the locality. If you are on a budget, then New Thippasandra can be a goldmine of cheap and cheerful eateries. Don’t go expecting any fast food chains or fancy restaurants here. Instead tuck into bottomless vegetarian thalis, fluffy idlis, hot bondas and piping hot chai, on the go if you can. At the beginning of the bustling New Thippasandra market (right across the Bata showroom), lies a tiny tea stall that opens shop at 6 am in the morning and fuels the daily lives of nearly 500 people (that’s their average footfall a day) everyday. The nine-year-old buzzing tea stall, owned by A Daniel, serves about 140 different kinds of teas and is always busy. Their most sought-after tea, according to Daniel, is the Ginger Elaichi variety. The teas here can be paired with snacks such as a Nippatu, samosa or even local varieties of cookies. Read more about Sharon Tea Stall here. True to its name, New Plantain Leaf (or NPL among regulars) is known for their meals served on a banana leaf. While the spread includes the regular suspects like pappu (dal), sambhar, a vegetable stir-fry and chutney, meat lovers can add on a portion of their spicy Gongura Chicken. The no-frills Andhra restaurant also has biryanis and kebabs to pick from, and a selection of Chinese. Come 5 PM, and this nameless stall a little ahead of New Plantain Leaf, comes to life with a flurry of frying activity. 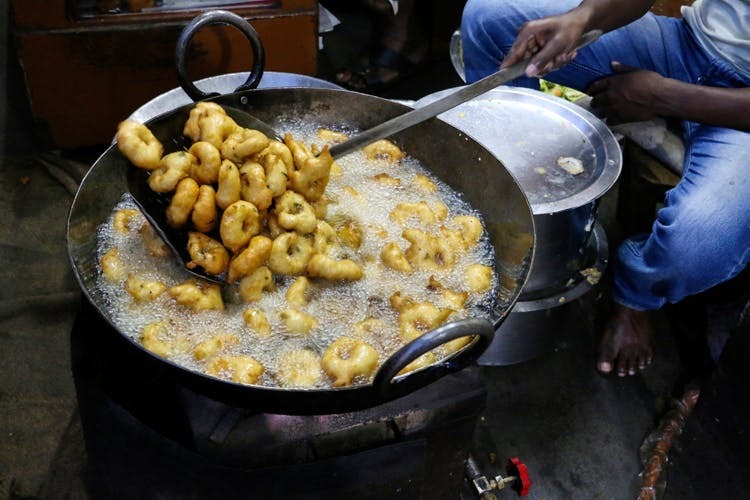 Hot mirchi bhajjis get deep fried in a cauldron bubbling with oil, vadas get double fried to get that fine crunch, and there’s also onion pakoras, samosas, and banana bhajjis on offer. The crowd outside the shop is a testimony to its popularity and business remains open only till stocks last. The mirchi bajjis and vadas are crunchy and rather delicious and the filter coffee from next door acts as the perfect foil for these hot numbers. This dive is all kinds of iconic and we have paid our homage to it here. The grubby curtains give way to a bar like space straight out of a movie from the 70’s. An elaborate wooden bar, and rows of glistening, cheap alcohol bottles, they also have an upstairs section for you to nurse your drinks and a fish fry or two (they make a mean Seer fish fry redolent with fiery masala). This popular snack joint has quite a few versions of vada pav for you to try. Apart from the classic vada pav, they have options like Mixed Veg Vada Pav and Schezwan Vada Pav to pick from. We also spotted flavoured kulfis to end your snacking on a sweet note. Bangalore’s first French food truck, Le Casse Croute has set up shop in New Thippasandra with their own kitchen space. We love their croquis (French toasted sandwiches) and suggest you try the Madame Garcia (with basil pesto, tomatoes and mozzarella) or the Monsieur Champetre, filled with mustard chicken, mushrooms, tomatoes and caramelised onions. For those with a sweet tooth, don’t leave without trying their Creme de la Creme — homemade caramel cream served with Langues de Chat (French cat’s tongue cookies). Burgers with juicy fillets, doner wraps, rice bowls and combo meals are what Leon Grill has on offer. Their Chicken Doner wrap with Pommes (fries) are a favourite with regulars, and so are their Peri Peri Chicken Burgers. The rice bowls make for a filling option — spicy Peri Peri Rice with sides like kebabs, chicken wings or falafel. Or you can go ahead and pick from their value-for-money burger or doner combos. Rather than hurrying through your shopping spree, we suggest you take the time to look around for some of the hidden gems waiting to be discovered here. Furniture to utensils and stationery to footwear, the New Thippasandra market is a budget shoppers’ paradise. Whether you’re looking to set up your new digs or just to stock up on essentials, the place has everything you could possibly need, even a vegetable market. Got footwear on your mind? Make your way to the Footin (Bata’s budget brand) outlet here and shop away to your heart’s content. While the prices are budget, the styles are all on trend. Along with the cute and colourful ballerina flats, slip-on sandals and pumps, they also have a selection of boots. Menfolk, browse through their collection of formals and casuals. Before you check out with your bagful of footwear, make sure you take a look at their funky socks, sunglasses and bags. What’s shopping without adding some stationery and books into the mix, right? While the lane has quite a few small stores selling stationery, we love Hema Book Stores for its comprehensive collection. From pens, colouring sets and folders to notebooks, sticky notes and even study material, they have it all. This might also be the only bookstore in the area. Although they don’t have a vast collection to offer, they stock popular novels by the likes of Dan Brown and David Baldacci. This place can be easy to miss if you aren’t looking for it. A narrow shop (more like half of a store) filled with crockery from top to bottom (mostly rejects, we suspect, but functional nevertheless), they have all that you’ll need to stock up your kitchen. Cute tea sets, coffee mugs and jars find a place on the shelves here along with ceramic bowls in different colours, flower vases and microwave safe cooking bowls. Going with current trends, they also stock mason jars of varying prices. While the store is in a small lane off the main road, you’ll see plenty of cane furniture near the pavement, indicating that you’ve reached Sri Vijayalakshmi Cane Furniture. Offering mostly ready made furniture pieces, their stock includes chairs, sofas, swing chairs, stools, tables and blinds. They’ll readily make alterations or minor customisations as well, depending on your requirement. Apart from selling furniture, Misra Furniture also rents out pieces from their store. Comfy sofas, chairs, dining table sets, and even colourful bean bags are among the products on offer here. Got a design in mind? These folks are all up to customise furniture according to your preferences (they have a factory in the city). Whether it’s a vintage style or a latest trend that you want to replicate in your room, they’ll sort you out. If you want more options, there are similar shops further down the lane, along with some selling mattresses, sideboards, rugs and the like. The sight of packets of mixture, different kinds of chips, chaklis, chikkis and other snacks stacked on the shelves (even in boxes on the floor) is what will probably lure you into Durga Condiments. With enough to spoil you for choice, we’re guessing you’ll end up spending quite a while stocking up on your favourite snacks (in bulk, perhaps?). Apart from the fried goodies, they have an array of cookies and biscuits. We particularly love their chocolate cookies. A favourite among many parents in the locality, Ramdev is probably a one stop shop for all that you will need for your little ones. Bibs to cute dresses, this is where you’ll find quality kids’ apparel at reasonable prices. They also have a range of toys to make your little tykes squealing in delight. Even if you happen to miss Coorg Coffee Works while busy on your shopping spree, the strong aroma of freshly ground coffee will guide you here. Stock up on coffee from Coorg (ground according to your preference), honey, spices and more at this tiny shop. Masalas for Coorg curries and the famed black Kachampuli vinegar (added to Pandi curry) is also available here. Thinking of doing up your walls with some of your favourite photos, posters or pictures, all nicely framed? Hit up Sree Balaji Frameworks to get them all framed, just the way you like it. Be it simple ones or trendy distressed designs, these folks will sort you out. A short walk from the New Thippasandra market is Dwaraka (Development of Weavers and Rural Artisans in Kalamkari Art), a boutique that puts the spotlight on all things handmade. This is where you can score bags made of Kalamkari fabric, traditional wall art, stationery and clothes, all inspired by nature and Indian mythology. What’s more, their prices are quite reasonable too. Read more about it here. Head here for high-end ethnic tailoring (think parties and weddings) by mother-daughter duo Padmini and Kavya Chandra. Particularly known for its incredibly intricate hand zardozi work, done onsite. Extra delights include a luxury range of woollen/cashmere shawls and stoles, and custom-made fabric blinds. Allow a three week turn-around for stitching. Indulge your stationery habit — and feel smug about saving the world at the same time, as everything here is upcycled. The reason we keep going back is the funky wrapping paper made by blockprinting over old newspapers, but you’ll also find journals made from film posters, travelogues, folders and even pouches/toolkits made from old tyres.